Sitting just 10 kilometers north of Mindanao and on Bohol Sea is the small yet captivating province of Camiguin. Hundreds of local and international visitors flock every year to experience what this little island has to offer — particularly the activities that await the watersports enthusiast. This pearl-shaped land mass is home to an active volcano popularly known as Mt. Hibok-Hibok. Expectedly, the adjacent areas are studded with interesting hot springs and craters as well. 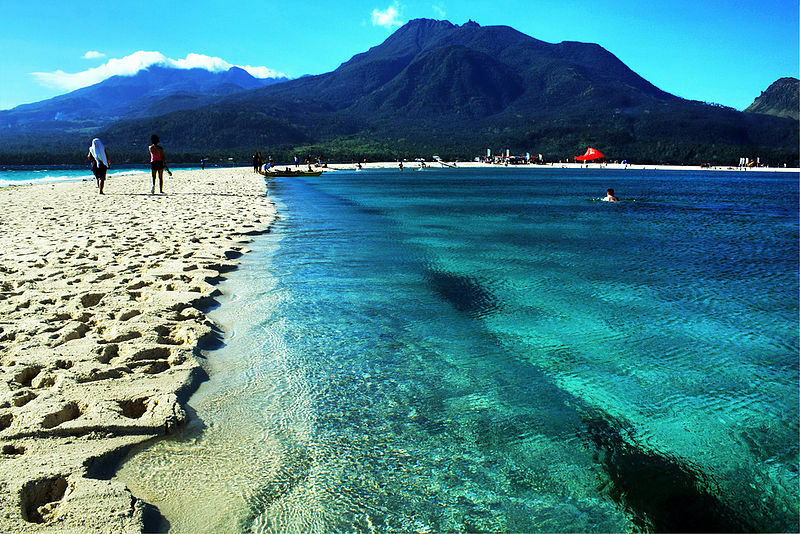 Camiguin can be described as a quaint and peaceful island. The remnants of Spanish colonisation are evident with the presence of centuries-old churches such as the Santo Rosario Church and the Old Catarman Ruins. Aside from that, Camiguin is also graced by beautiful and ornate ancestral homes usually found along prominent streets. Water features are in fact Camiguin’s charm and these include two waterfalls (Katibawasan Falls and Tuasan Falls), six springs (e.g. Ardent Hot Spring, Sto. Niño Cold Springs, Tangub Hot Spring) and kilometres-worth of coastline. Aside from the endemic flora and fauna thriving on land, the seas of this little island house lovely corals, sea turtles and fishes of different kind. Its remarkable underwater life is one thing — the shores are another. The consistency of the sand is enough to make one bask in sunshine and frolic with the cold, summer breeze. It is indeed a lovely experience to try out various water activities given the picturesque background and tropical climate in Camiguin. Starting the list is the wholesome and laid-back windsurfing. Camiguin may be a hot plate of sizzling volcanoes and springs but it is absolutely blessed with a serene climate and tranquil waters. Just in time for low windy days, tourists can get a whiff of Camiguin’s sea breeze by including windsurfing in their travel to-do list. It is definitely impossible to miss out diving in this list. In fact, it would be a waste not to discover the life thriving underwater. Camiguin Island is one of the great places in the Philippines to scuba dive. Every dive site in the province offers a huge forest of black and colourful corals. If you’re lucky, you may also spot whale sharks and manta rays. Diving sites in Camiguin are under the management of friendly diving trainers and travel guides. One of Camiguin’s iconic sites is the Sunken Cemetery. And the better way to explore it? Only through snorkeling. The now-sunken resting place has brought such revelling life in the form of a kaleidoscope of small fishes and corals. A plethora of marine life has decorated the hapless tombstones dating back to the 19th century. Another snorkel-worthy area is the Giant Clam Sanctuary of Guinsiliban. If you want some up-close and personal experience with the endangered Tridacna, then better not miss this spot. The Philippines is surely an archipelago that boasts incredible shorelines and a diverse marine life. Because the country lies along the pelagic route, it has become one of the world’s most sought-after gamefishing spot. And the seas of Camiguin are of no exception. From December to August, seasoned anglers can test their luck at spotting game fishes such as the barracuda, great trevally and wahoo. Want to dine tuna? Try fishing between July to October. And if you’re in for some sailfish, mark your calendars between March to June. Who says parasailing is a luxury only offered by the world-class resorts of Boracay? Camiguin has it too! One of the island’s resorts particularly offers this exhilarating activity for about Php 2,000 per round. Got a strong heart and a daredevil persona? Then this activity is definitely for you. Fly high and get blown away as Camiguin’s sea breeze sweeps you off your feet. There’s nothing more enjoyable than view the island above 100 feet, indeed. Other than the mainstream tourist spots in the Philippines, one should consider visiting Camiguin as well and try out a myriad of adventure activities. Beach bums, daredevils and water sport aficionados would surely create wonderful memories in this humble little island.